The prediction of human pharmacokinetics is an extremely difficult endeavor during the selection of drug candidates for further human clinical testing. Despite a variety of available in vitro and in vivo methodologies, successful predictions are still difficult when performing them prospectively. This chapter gives a general overview of in vitro and in vivo methodologies used to predict human pharmacokinetics. One of the key functions of DMPK scientists in drug discovery is prediction of human pharmacokinetics and the human dose. The general concept is outlined in Fig. 7.1. The three most relevant parameters are bioavailability (F), clearance (CL; clearance also contributes to F), and volume of distribution (Vd). As described in Chap. 3, F is determined by the fraction absorbed from the intestine (Fa), the fraction that escapes intestinal metabolism (Fg), and the fraction that escapes hepatic metabolism (Fh). Other pharmacokinetic (PK) parameters, such as half-life (i1/2), can be derived from these parameters. Numerous methods are available for prediction of these parameters, and they are listed in Table 7.1. The most commonly used methods are described in subsequent sections. More sophisticated predictions can be made with a physiologically based pharmacokinetic (PBPK) model using a range of preclinical in vitro and/or in vivo data. Figure 7.1. Flowchart depicting methodology for human pharmacokinetic and dose prediction. ADME = absorption, distribution, metabolism, excretion; IVIVE = In vitro-in vivo extrapolation; PD = pharmacodynamic; PK = pharmacokinetic. The fraction absorbed is influenced by the intestinal solubility of the drug and the permeability across enterocytes. Solubility and dissolution rate studies can predict if absorption is limited by the solubility of the drug, and this is reflected by the maximum absorbable dose. Note that the magnitude of the anticipated human dose should be taken into consideration as well. In vitro permeability studies involving Caco-2 or MDCK cells or PAMPA provide a good idea about the intrinsic permeability of the drug. Details are provided in Chap. 4. Efflux by transporters can limit the fraction absorbed, but intestinal transporters can be saturated relatively easy. Finally, preclinical PK data can be used to predict Fa and the first-order absorption rate constant (ka). The fraction absorbed combined with knowledge of intestinal metabolism and systemic clearance can be used to predict F.
Although monkeys may be good models to predict Fh in humans, Fa x Fg is frequently substantially smaller in monkeys than in humans for drugs that undergo a significant degree of metabolism (Akabane et al. 2010). This probably reflects an increased capacity for intestinal metabolism in monkeys, because an earlier study showed that Fa in monkeys correlates well with Fa in humans (Chiou and Buehler 2002). Although dogs are commonly used to study oral absorption, Fa in dogs is frequently larger than Fa in humans (Chiou et al. 2000). In addition, Tmax tends to be longer in humans than in dogs. 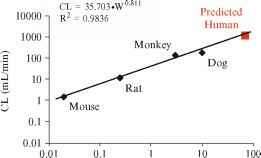 The correlation between Fa in rats and humans is more robust (Chiou and Barve 1998). Clearance predictions can be based on either human in vitro ADME data or in vivo PK data from preclinical studies. In vitro-in vivo extrapolation is the process by which organ clearance is scaled up using in vitro data. Since the liver is the main organ involved in metabolism of xenobiotics, this section focuses on the liver as the organ of interest. A flowchart of the process of in vitro-in vivo extrapolation is shown in Fig. 7.2. Figure 7.2. Flowchart depicting the process of in vitro-in vivo extrapolation. CLhepatic = hepatic clearance; CLint = intrinsic clearance; HPGL = hepato-cytes per gram of liver; MPPGL = microsomal protein per gram of liver. As mentioned above, we will be covering only CLhepatic in this chapter. For drugs and compounds that are eliminated via organs other than the liver, estimated organ clearances can be summed together to get an estimate of total body clearance. Metabolic CLint is a measure of the ability of hepatocytes to eliminate a drug or compound irrespective of other external factors, such as protein binding and hepatic blood flow. Determination of metabolic CLint can be accomplished using traditional enzyme kinetic methodologies or substrate depletion methods. Michaelis-Menten Kinetic Parameters The relationship between the rate of a metabolic reaction and the substrate concentration is depicted in Fig. 7.3. Figure 7.3. Plot of relationship between metabolic reaction rate (v) and substrate concentration (C). Km = Michaelis-Menten constant; Vmax = maximum rate of the metabolic reaction. v — rate of the metabolic reaction. Km = Michaelis-Menten constant (i.e., substrate concentration when v is V2 of Vmax). C = concentration of the substrate (i.e., drug or compound of interest). Based on the above equations, CLint is concentration dependent at high substrate concentrations approaching Km. For most drugs, the concentrations administered in vivo are under conditions of linearity with respect to CLint. CLint estimated from in vitro incubations are in units of volume/time/mg of microsomal protein for microsomes (e.g., mL/min/mg microsomal protein) and volume/ time/number of cells for hepatocytes (e.g., mL/min/106 cells). Vmax = maximum rate of the metabolic reaction. in vitro incubations must be performed at multiple substrate concentrations for a good estimate of Vmax and Km. In addition, the metabolite reaction that is being monitored must be the formation of a major metabolite for a primary metabolic pathway in order for a prediction to be accurate. Alternatively, for cases in which multiple major metabolic pathways are responsible for drug elimination, the formation rates of the primary metabolites from these multiple pathways must be monitored, and CLint of each pathway must be estimated and summed together to get the overall CLint. The substrate depletion rate may also be estimated at a range of substrate concentrations to estimate a hybrid overall apparent Vmax and Km. Regardless, every method utilizing Michaelis-Menten kinetic parameters requires that incubations be performed at a wide range of substrate concentrations. Due to the more resource intensive nature of this method of CLint estimation, substrate depletion estimation methods performed at one substrate concentration with C << Km have become common. If tl/2(in vitro) is in minutes, Vincubation is in mL and Pmicrosome is in mg, then CLint is in units of mL/min/mg microsomal protein. It is important to keep track of units when performing in vitro-in vivo extrapolation. The in vitro t1/2 method can also be applied to hepatocytes, in which case Pmicrosome would be replaced with "the number of hepatocytes in the incubation". Since the number of hepatocytes in an incubation is usually expressed as "X x 106 cells", the units for CLint in the preceding example would be mL/min/106 cells. A common concentration used for estimation of CLint using the in vitro t1/2 method is 1 mM. In this section, we present scaling factors for the conversion of CLint estimated from in vitro incubations to CLint for the whole liver or body (Tables 7.2 and 7.3). A detailed analysis of MPPGL and HPGL is not available for monkeys and, therefore, the human values of these parameters should be used for monkeys (Table 7.2). 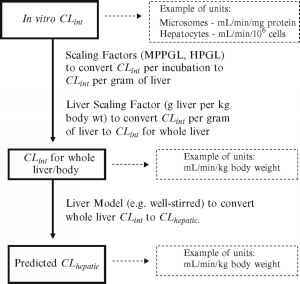 Conversion of CLint for the whole liver or body to CLhepatic, which includes the impact of physiological factors such as blood flow and protein binding, involves the use of a liver model such as the well-stirred model, the parallel tube model, or the dispersion model. More details on the well-stirred model including values for hepatic blood flow are presented in Chap. 1. In vitro-in vivo extrapolation is usually "validated" by determining if the in vitro ADME data correctly predict the clearance observed in preclinical studies. Although this is valuable, human clearance can involve pathways distinctly different from preclinical species, which can render this "validation" of limited value. log P/D = log P if molecule is a base (pKa >7.4) and log D74 if molecule is an acid or neutral compound (pKa<7.4). This equation has also been extended to include calculation of the unbound fraction in hepatocytes (Kilford et al. 2008). Allometry was initially used to establish an empirical relationship between the body surface area of an animal and its body weight. Currently, allometry is widely used to predict human clearance based on preclinical clearance values. Figure 7.4. An example of allometry to predict human clearance. CL = clearance. An example is presented in Fig. 7.4. Note that the units for CL in this equation are mL/min, which subsequently needs to be converted to mL/min/kg. It is worth emphasizing that allometry is of little value if different clearance mechanisms are operational across species. Several types of correction factors have been proposed to improve the quality of these predictions. These factors decrease the predicted human clearance values relative to standard allometry. A comprehensive analysis suggested that "none of the correction factors resulted in substantially improved predictivity" (Nagilla and Ward 2004). Two species allometry has been proposed as well, and Tang et al. 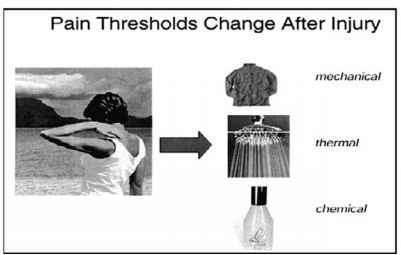 (2007) indicated that these methods were as predictive as three species allometry with the "rule of exponents." • Allometry is of little value if different clearance pathways are operational. • Allometry may be most useful if the clearance is predominantly renally mediated across species. • The R2 value of the correlation should be considered when assigning a degree of confidence in the prediction. • An exponent, significantly different from 0.7 (in particular <0.5 or > 1.0) is indicative of significant species differences and should reduce the confidence in the prediction (Hu and Hayton 2001). • The preclinical species with the lowest body weight (usually mouse or rat) and the highest body weight (usually dog) have the greatest influence on the human prediction. Although some level of success has been achieved with allome-try, some researchers have shown that the method is not more predictive than simpler approaches, such as single species scaling (Hosea et al. 2009) or the single species liver blood flow method (Nagilla and Ward 2004; Ward and Smith 2004). Opinions are divided about the most predictive preclinical animal model for humans. Hosea et al. (2009) observed good prediction of human pharmacokinetics using only rat data, which is also more practical than obtaining dog and/or monkey data. Other single species scaling methods were proposed by Tang et al. (2007) with the CL units being ml/min/kg. Clearance, as percentage of liver blood flow in preclinical species can be a predictor of human clearance. Ward and Smith (2004) suggested that the monkey is the most predictive species. Vd is predominantly governed by physicochemical parameters, and, consequently, species differences are less pronounced for Vd than for metabolic clearance. Therefore, human Vd is easier to predict than CL, and the differences between various methods are generally limited unless the Vd is remarkably small or large. Allometry has been used with some degree of success to predict human Vd. Figure 7.5. An example of allometry to predict human volume of distribution. Vd = volume of distribution. Single species scaling is based on the similarity of Vd across species. Some have advocated using an identical Vd in humans as in preclinical species, but a correction factor is commonly applied to account for differences in plasma protein binding. In the Oie-Tozer method, the unbound fraction in human plasma and the average unbound fraction in tissues from preclinical species (assumed to be equal to the unbound fraction in human tissues), combined with appropriate human values for plasma and fluid volumes, are used to predict the human Vd (Obach et al. 1997). PBPK models offer a sophisticated integrated framework to understand compound disposition in the body and predict human pharmacokinetic profiles. The concept is described in detail in Chap. 10. Methods predicting human pharmacokinetic profiles involving normalization of animal plasma concentration-time profiles include the Wajima plot and the various Dedrick methods. These methods are based on the assumption that plasma concentration-time profiles from different species are superimposable upon appropriate normalization of concentration and time scales. For illustrative purposes, a representative concentration-time profile and a Wajima plot are shown below. Each line represents the concentration-time profile of one animal species. A Wajima plot involves normalization of the concentration scale by dividing it by the steady-state concentration (Css; calculated as Dose/Vss]. The time scale is normalized by dividing it by the mean residence time (MRT; calculated as Vss/CL). The composite profile of all preclinical species is used as the predicted human concentration-time profile. Ideally, normalized concentration-time profiles from various species superimpose upon each other, and predicted human profiles are obtained by back converting the normalized profile using predicted Css and MRT values for humans. The original set of compounds for which Wajima plots were applied were antibiotics with small Vd values that were mainly cleared renally in humans. A distinct advantage of this plot over the various Dedrick methods is that the CL and Vss values used to calculate predicted Css and MRT values for humans can be obtained from any method of prediction. In contrast to the Wajima plot, the various Dedrick methods utilize allometric principles to normalize concentration and time scales. Detailed information on the Wajima plot and Dedrick methods can be found in Wajima et al. (2004) and Mahmood (2005). Human PK predictions are performed extensively preclinically and can determine the fate of compounds under consideration for development. At an earlier stage, predictions are based on limited data sets (in vitro and rodent in vivo data), and the goal is usually to categorize compounds and identify those that are worth pursuing further in preclinical studies. Once a more complete data set is available, it is possible to make more refined human PK predictions using perhaps more than one method, but even at this stage the predictions are more a reflection of assumed risk. Prospective predication of human pharmacokinetics continues to be an extremely difficult endeavor. For example, the most successful clearance methods generally have success rates of 60-80% with success defined as being within twofold of the observed value in humans. Often, having more preclinical data does not improve the prediction success rate. Indeed, Beaumont and Smith (2009) commented that "Generation of further large amount of preclinical information on a compound with uncertain human pharmacokinetic prediction tends to add confusion rather than clarity." Finally, the predicted PK properties of each drug candidate must be carefully evaluated in the context of its other properties and liabilities (i.e., in vivo potency, toxicity, etc. ).